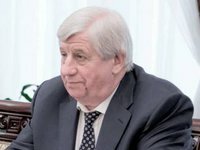 Prosecutor General Viktor Shokin, who was on leave, returned to work, a source at the Prosecutor General's Office (PGO) told Interfax-Ukraine. "Shokin is back to work and in the office now," the source said. As was reported, President Petro Poroshenko said in his address to the nation on February 16 that he had asked Shokin to step down. On the same day, Poroshenko tabled a motion in parliament to dismiss Shokin. Presidential envoy in parliament Stepan Kubiv has been authorized to announce the motion at a parliament meeting. On February 22, a draft resolution on MPs' consent to dismiss the chief prosecutor was registered on the parliament's website. However, on February 29, PGO prosecutor Vladyslav Kutsenko announced that Shokin had taken a regular, paid leave. Shokin was appointed Prosecutor General in February 2015. Under the Ukrainian Constitution, the Prosecutor General should be appointed and dismissed by the president with the parliament's consent. However, lawmakers could hold a vote of no-confidence, after which the Prosecutor General should resign if there is a required number of votes.